Most people George Zweig’s age are long retired. But for the 78-year-old -- who has enjoyed a wildly successful and varied career as a physicist, military strategist, CalTech professor, inventor, software entrepreneur and hedge fund investor -- not working isn’t an appealing option. And so instead of joining his peers in their leisure-filled golden years, Zweig is entering a world typically reserved for men and women less than half his age: He’s starting a hedge fund. As the WSJ notes, the cutthroat industry, known for its low startup success rate, is a notoriously tricky one to master, even for founders at the prime of their career. But Zweig feels he’s up for it. “It’s a fantastic challenge,” he told the outlet. As a man of a riper vintage, Zweig is not alone in chasing (and finding) success later in life. While Silicon Valley may fetishize youth -- a bias compounded by Hollywood’s embrace of the dorm-room-startup narrative -- the reality is more nuanced. For many, the big breaks arrive long after the crow’s feet. Unconvinced? Charles Flint founded IBM at 61. Ray Kroc opened McDonald’s in his early 50s and Harland Sanders started KFC in his 60s. At 44, Sam Walton wasn’t exactly old when he founded Walmart, but he was far from a college-aged teenager. Still skeptical? A recent report by the Kauffman Foundation found that most people who became new entrepreneurs last year were in the 45 to 54 age bracket, followed next by those in the 55 to 64 demographic. Pair that with another study (which examined 502 successful engineering and technology companies and determined that the median age of their founders was 39), and there’s a solid case to be made that experience, not youth, is the key to entrepreneurial success. As he embarks on his next chapter, Zweig will certainly tap into his extensive library of life experience, particularly with algorithms: His hedge fund plans to differentiate itself from competitors by developing software that turns large amounts of data into visual images, the WSJ reports, which can be used to uncover patterns and predict movements in the market. 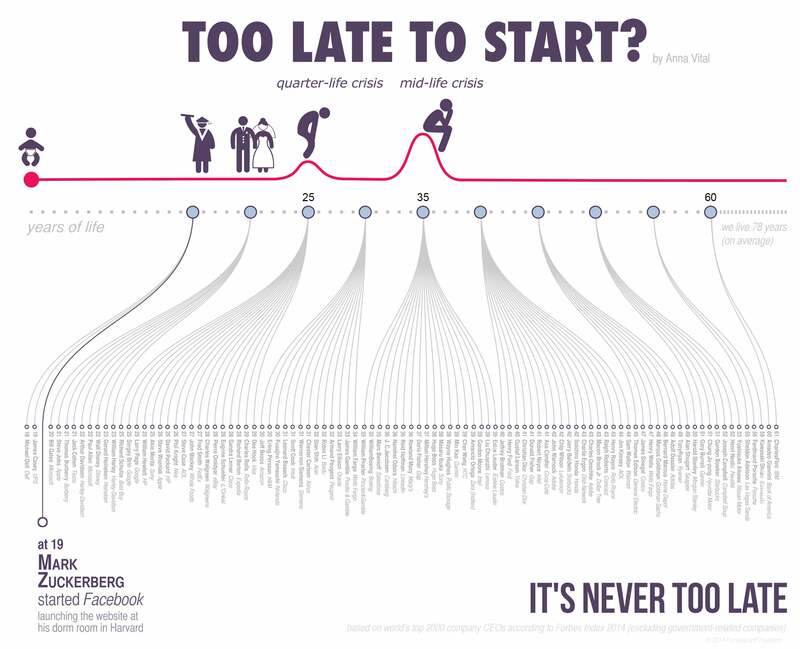 For more examples of entrepreneurs who started businesses well after they graduated college, check out this infographic, embedded below, from startup organization Funders and Founders and information designer Anna Vital.